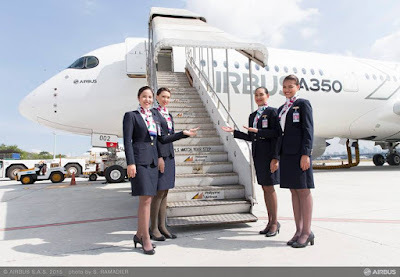 Aviation Updates Philippines - The national flag carrier, Philippine Airlines is continuing its expansion in the international sector while improving services and increasing its aircraft utilization, according to the aviation think-tank Centre for Aviation. According to CAPA Analysis, Philippine Airlines will be adding two destinations in the Middle East and three in the Australasia region over the next few months. During its 75th Founding Anniversary, it will launch its Cebu-Los Angeles route to be flown by an Airbus A340-300. Philippine Airlines will be expanding in the Middle East and Australasia networks. The carrier recently announced that it will launch flights from Manila to Kuwait and Jeddah via Dubai in an effort to improve its loss-making Dubai flights. According to the airline route tracker AirlineRoute.net, Philippine Airlines will introduce its Manila - Dubai - Kuwait route on January 1, 2015 and Manila - Dubai - Jeddah route on January 2, 2015, respectively. The Kuwait route will be operating 4 flights per week while the Jeddah route will be operating 3 flights per week for a total of 7 flights per week for the Dubai route. All flights will be operated by PAL's Airbus A330-300 aircraft. This move also improves the utilization rates of the A330 aircraft. Meanwhile, PAL is also launching Manila-Cairns-Auckland route on December 1, 2015. The flights will be flown by an Airbus A320 aircraft. "The route will stimulate passenger traffic along three travel streams - Manila and Cairns, Manila and Auckland as well as Cairns and Auckland. The new service allows Philippine Airlines to cater to the travel needs of business and leisure travelers and showcase its distinct brand of service marked by Filipino warmth, charm and hospitality. With close to 40,000 Filipinos residing in New Zealand, the new service is their convenient link to their home country - the Philippines," Philippine Airlines President and Chief Operating Officer Jaime Bautista told a New Zealand news website. The carrier's long haul operations will likely improve over the addition of two leased Boeing 777-300ER aircraft to be delivered in late-2016. It also expects the acquisition of around six Airbus A350-900 High Gross Weight (HGW) variant in 2017 that will be used for non-stop Toronto and New York flights. Airbus has said that the flag carrier does not need to order its newly introduced Airbus A350-900ULR variant, "which will be available from 2018 and has been ordered by Singapore Airlines for non-stops to the US", CAPA said. The HGW variant is able to fly from Manila to New York without payload restrictions. With the addition of new next generation aircraft, Philippine Airlines will expand its international flights and decrease the utilization rates of the Airbus A340 aircraft once it arrives. PAL's ageing Airbus A340 fleet will still be utilized but will slowly receive lower utilization rates starting 2017. Meanwhile, PAL is currently evaluating potential routes in the east and west coasts. As early as late-2016, the carrier will be able to launch new flights to other parts of the country with the addition of two new Boeing 777 aircraft.